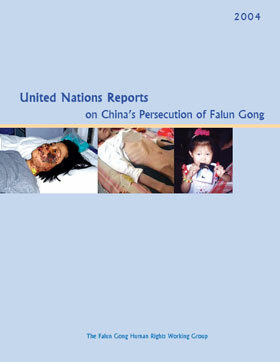 Newly published book compiles U.N. reports on wide-spread denial of freedom of belief, abuse, torture and extrajudicial killings of Falun Gong practitioners. LONDON [EFGIC] – The Falun Gong Human Rights Working Group (website) has announced the publication of The 2004 United Nations Reports on China’s Persecution of Falun Gong. In its second edition, the book is a collection of reports issued by the Special Rapporteurs of the United Nations Human Rights Commission on China’s violent, and often deadly, persecution of Falun Gong practitioners. Each year, the U.N Special Rapporteurs publish summary reports on human rights situations around the world. The violations against Falun Gong have attracted increasing condemnations from the Special Rapporteurs. “These findings and reports convincingly dispel the Chinese government’s claim of China having its ‘best period of human rights’,” says Ms. Liying Zheng, a volunteer editor for the Working Group. Contained in the book are reports issued by Rapporteurs from a number of different specialist areas, including Torture, Extrajudicial, Summary and Arbitrary Executions, Violence against Women, Freedom of Religion or Belief and the Freedom of Expression. The book also documents more than 30 torture methods commonly used on Falun Gong practitioners throughout China, many of which are demonstrated in photographs taken of the victims inside China. An updated background section provides an introduction to Falun Gong, its cultural and historic roots, as well as an historical review of how Falun Gong grew in popularity throughout China before the persecution against the traditional Chinese practice was launched in 1999 by then-Chinese leader Jiang Zemin. Falun Gong, also known as Falun Dafa (about), is a practice of meditation and exercises with teachings based on the universal principle of “Truthfulness-Compassion-Tolerance.” Practised in over 60 countries world-wide, Falun Gong has roots in traditional Chinese culture. With government estimates of as many as 100 million practising Falun Gong in China, China’s then-Communist leader, Jiang Zemin, outlawed the peaceful practice in July 1999 (report). Since that time, Jiang’s regime has intensified its propaganda campaign to turn public opinion against the practice while imprisoning, torturing and even murdering those who practise it. The European Falun Gong Information Centre has verified details of 1150 deaths (reports) since the persecution of Falun Gong in China began in 1999. In October 2001, however, Government officials inside China reported that the actual death toll was well over 1,600. Expert sources now estimate that figure to be much higher. Hundreds of thousands have been detained, with more than 100,000 being sentenced to forced labour camps, typically without trial.